As FINRA transforms CRD, visit this page often to stay up-to-date on all topics and events related to the new CRD system. Learn more below about new and upcoming CRD features, how to access them, and related upcoming events. Don’t forget to become a subscriber if you want us to send you emails about new CRD, and please be sure to send us feedback about your new CRD experience. We want to hear from you. Virtual and in-person attendees can listen to a panel discussion about the new CRD system and the Financial Professional Gateway (FinPro). You can also demo and discuss the new systems with FINRA staff at their exhibit booth. FINRA is committed to attend and present at Securities & Insurance Licensing Association’s (SILA) National Education Conference this fall. We will update this page with more details when available. Cloud-based technology is an essential component of our ongoing transformation effort, and FINRA moved data in April to its new “cloud” platform during three consecutive weekends. Please visit our availability schedule for the complete listing of dates and hours of these planned outages. FINRA’s Registration and Disclosure (RAD) Training team conducted a one-hour virtual overview of the new CRD system designed to familiarize users with the latest functionality. Registration is now closed. Similar future events will be advertised on this page as they are scheduled. FINRA’s Registration and Disclosure (RAD) Training team offered a two-day course right after the 2019 ARM Annual Educational Conference. Foundations training offers practical, hands-on training for both classic and new CRD functionality, as well as a discussion of RAD hot topics and an overview of IARD. Learn more about future training opportunities on the CRD Training & Support page. Listen to Derek Linden, FINRA’s executive vice president of Registration & Disclosure (RAD) discuss the CRD Transformation during episode 29 of FINRA Unscripted. 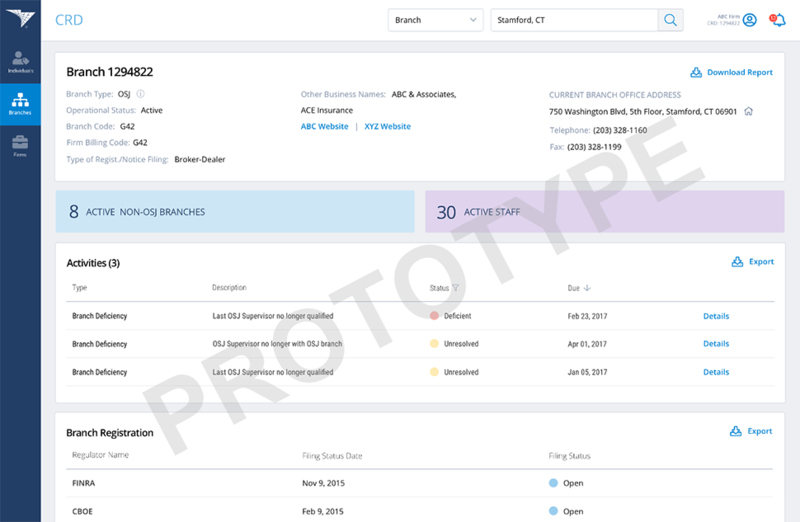 the introduction of ways to support automation and leverage information via a brand new reporting capability. On January 26, 2019, FINRA added a new feature in the new CRD system that allows users to query and view firm’s associated individuals. 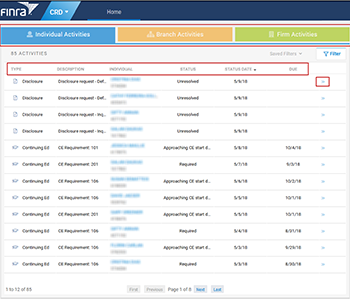 FINRA systematically entitled all broker-dealer firm administrators and users who have similar access (View Individual Information) in classic CRD to this new feature in new CRD. 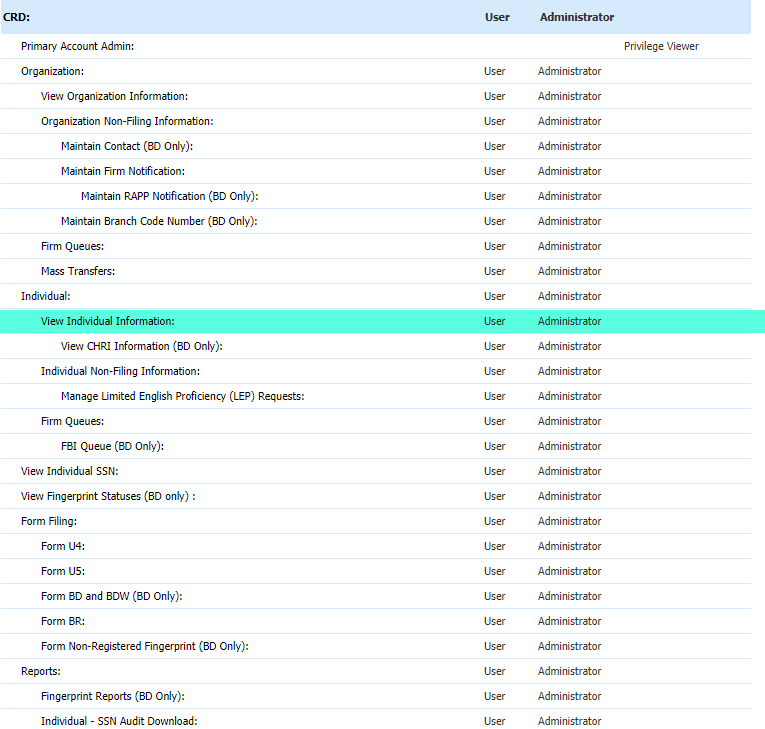 Visit the New CRD Entitlement page for complete information about accessing new CRD functions. 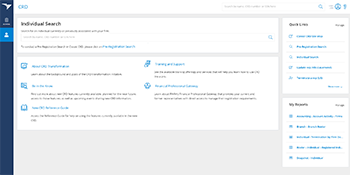 New features were recently added to the Financial Professional Gateway (FinPro), a secure online system for current and formerly registered individuals. As of October 11, 2018, individuals who have created a FinPro account will receive an email notification whenever a new Form U5 filing is submitted in CRD. FinPro maintains a PDF version of the most recent Form U5 submission for review and download on an individual’s account. Please note that firms are also required to provide registered individuals with a copy of their Form U5 within 30 days. For more information, please visit the Financial Professional Gateway page on finra.org. FINRA thanks the participants of this call and at their request, have posted the slides shared during the presentation, which included an overview of current and future features of FinPro. FINRA’s Registration and Disclosure Department held a series of conference calls to discuss the SIE Exam and Exam Restructuring initiative. The calls included an overview of the Securities Industry Essentials (SIE) Exam, the restructure of representative-level qualification exams, and the consolidation of registration rules that will become effective October 1, 2018. 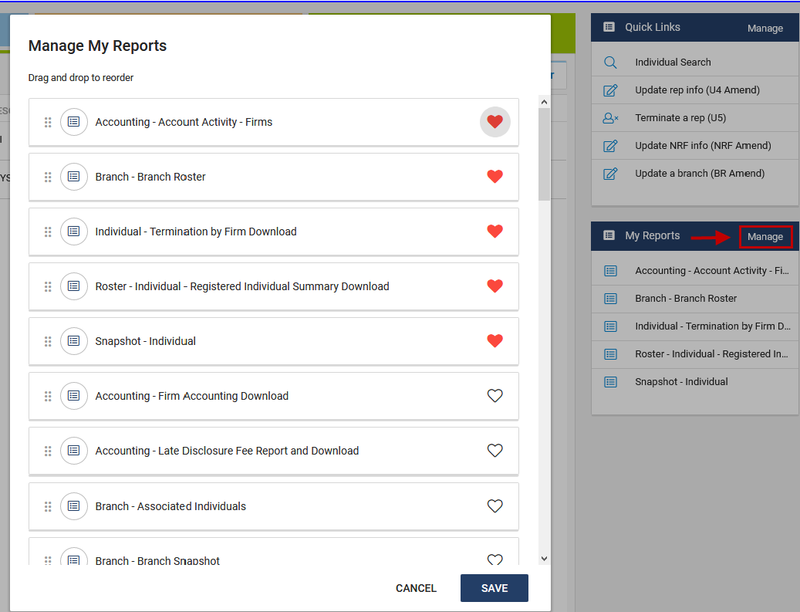 On July 28, 2018, a new export feature will be implemented which allows users to download the data from the Activities list into a .CSV file. Once the data is exported, firms can use or manipulate the data as needed to support their compliance work processes. FINRA members should complete the form below, and click "Submit" to proceed. As FINRA transforms CRD, new CRD features will be released incrementally to organizations that currently use Web CRD (now referred to as “classic CRD”). 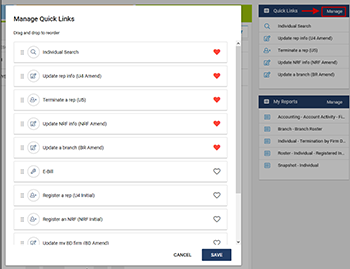 These new features will be added alongside classic CRD, allowing entitled users to experience the benefits of the new system while still having the combined full functionality of both systems to complete their work. We will update this page as enhancements become available. See the New CRD Reference Guide for detailed information and navigational support for the features described below. Keep in mind that during this development phase, new CRD features interact with classic CRD. If users do not have the necessary classic CRD privileges for an activity or link they select in the new CRD system, an Access Denied message will display. Learn more on the New CRD Entitlement page. See the New CRD Reference Guide for more information. Access to querying and viewing individual information is governed by “My CRD,” the parent privilege for the new CRD system. All new CRD users and administrators will have access to this new feature. On January 26, 2018, classic CRD users and administrators whose accounts were entitled with “View Individual Information” privileges were systematically entitled with the “My CRD” parent privilege for the new CRD system. 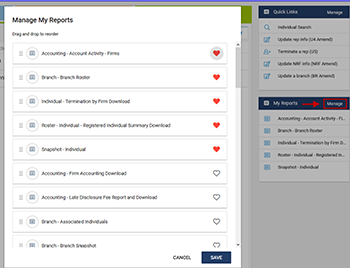 Filter and save personalized views of individual, firm and branch activity items in order to monitor recent and upcoming status changes and requirements. Select and order your favorite system features into a convenient list on the new CRD system home page. Links may point to the relevant functionality in classic CRD, E-Bill, and other FINRA-administered systems. Elevate the CRD reports you use to the new CRD home page. Note: All screenshots on this page are provided for illustrative purposes and subject to change. Learn more about new CRD features that are under development in the section below. The ability to export information directly from a branch profile. As FINRA transforms CRD, new CRD features will be released incrementally to organizations that currently use Web CRD (now referred to as “classic CRD”). A new family of privileges called “My CRD” will control this new CRD functionality, and FINRA will communicate in the future if additional systematic entitlements are planned. 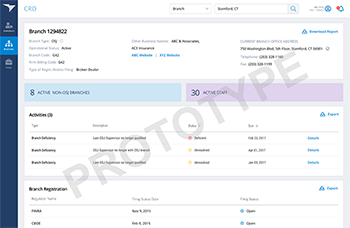 New CRD features will be added alongside classic CRD, allowing entitled users to experience the benefits of the new system while still having the combined full functionality of both systems to complete their work. Keep in mind that during this development phase, new CRD features interact with classic CRD. If users do not have the necessary classic CRD privileges for an activity or link they select in the new CRD system, an Access Denied message will display. We will update this page as enhancements are made to CRD that affect entitlements for firms and individuals. Questions? Send us an email or call (301) 869-6699. Administrators can find the My CRD family of privileges at the bottom of the current application entitlement list in the Account Management system. Learn more below about each entitlement privilege and their corresponding system features. See the New CRD Reference Guide for more information about the new CRD system. 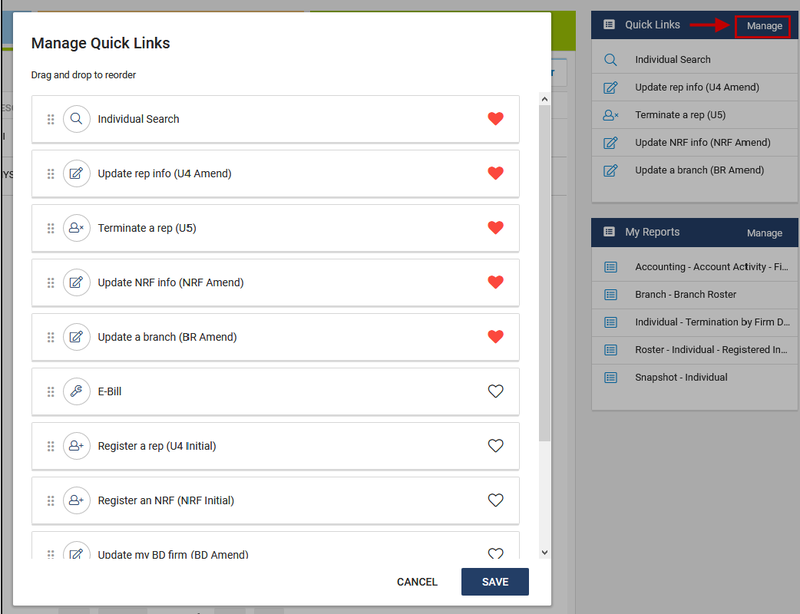 The new CRD re-imagines classic CRD queues as consolidated, customizable task lists called Activities. The Activities entitlement grants user access to all three activities categories (individual, branch and firm). 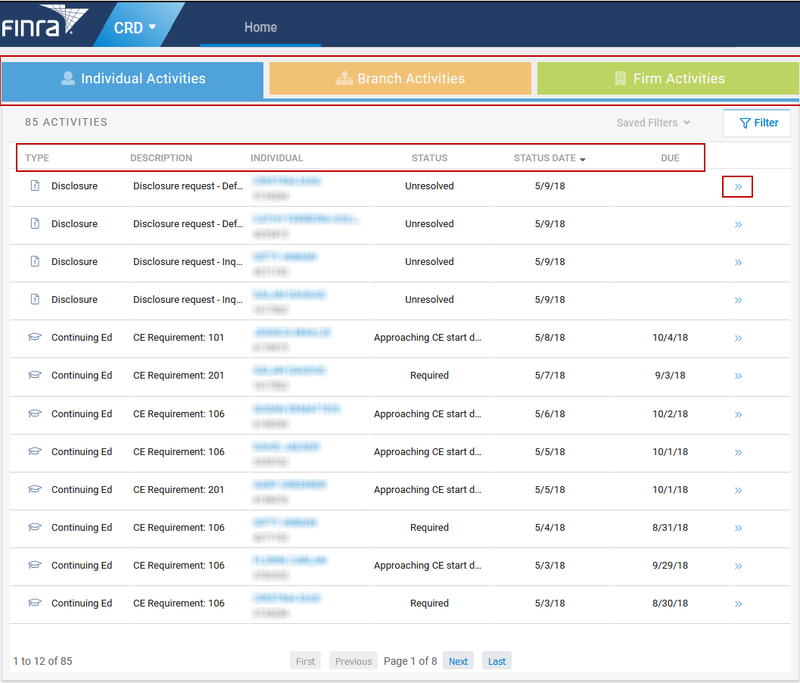 This entitlement privilege manages access to the new CRD My Reports widget, which allows users to select and order links for their preferred CRD reports. FINRA is systematically permissioning broker-dealer firm users and administrators with access to new CRD features upon their release. Users who possess privileges to the corresponding classic CRD features are granted entitlements to the new CRD functionality. Entitled SAAs and CRD administrators can grant or remove access as appropriate for their users; please see the FINRA Entitlement Reference Guide for complete instructions about managing account access. Parameters for future systematic entitlements are detailed on the “Upcoming Features” tab. 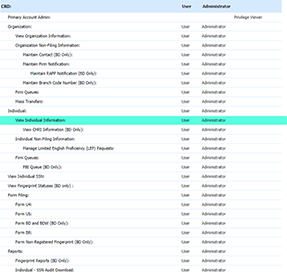 Learn more about the systematic entitlement parameters used during past system releases below. Access to the new CRD system requires users to have the appropriate entitlement from their organization. Contact your organization’s administrator if you need to request access. Learn more about FINRA’s Entitlement Program.